Québec winters are among the harshest in the world. And winter, of course, means snow. It often comes in heaps combined with rollercoaster temperatures—and it brings different types of dangers for your home. To keep your home a safe and healthy place in the winter, you’ll need to do some basic inspection and maintenance. We’ve created a snow checklist to help you avoid unpleasant surprises and reduce the risk of damage. You’ll need to remove any snow that has accumulated before it stops them from working properly. If you have a heat pump, keep it clear too. In addition, to properly protect the propeller and fan, it’s best to use a snow guard— a mesh cover installed on top of the unit. Snow guards are easy to get from the pump manufacturer and oh-so-handy! When snow piles up on your roof and isn’t properly cleared, it can threaten the roof’s structural integrity and cause other problems like water infiltration during melting and, even worse, partial or total collapse of the roof. The watchword? Vigilance! 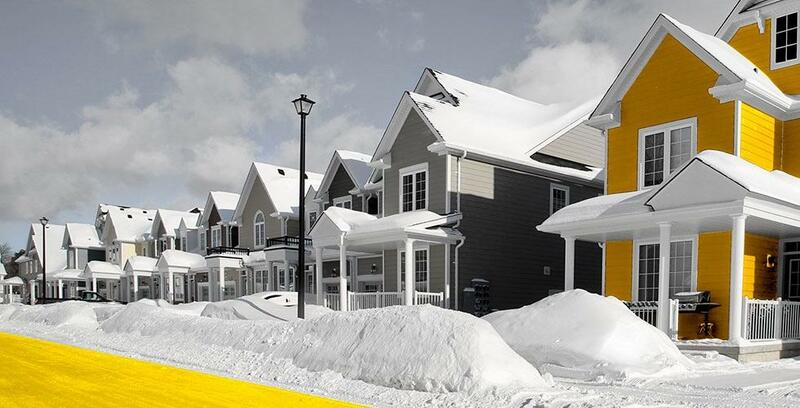 Although roofs are usually built to withstand the snow loads typical of québec winters, you still need to be on the lookout, especially during blizzards and extreme weather. Also, houses have different tolerances depending on the type of roof: flat or sloped, with vents, chimneys, gables, etc. If you’re unsure, a home inspector can help you determine the weight that your home’s roof can withstand. The recommended method for removing snow from your roof is to use a telescoping shovel from the ground. If you’re uncomfortable doing so, especially if the roof is icy, call in a specialized contractor. The Commission des normes, de l’équité, de la santé et de la sécurité du travail website explains how to safely remove snow from flat roofs and sloped roofs (in french only). Also, keep an eye on the attic. if heat escapes through the roof due to poor insulation, snow will melt on the roof, which can cause leaks inside the home when ice dams form at the edges of the roof. Keep an eye on the basement too! remove snow in front of basement windows and in window wells. this is important for two reasons. First, because the risk of infiltration is high when a home has openings in the foundation near the ground. heat loss through windows and other openings can melt snow, turning them into sieves. Taking the precautions described in this article can give you peace of mind, knowing you are better protected from the dangers of snow. This leaves you free to stay warm inside...or head out for some winter fun! feel free to share this checklist with your networks so that friends and family can also put these preventive measures into practice.